This story is the final part in a four-part series about our Halfsy Hero, Melinda Soerjawitaka. Our series followed Melinda and three other heroes as they trained for the November 6th Good Life Halfsy. When Melinda started training for the Good Life Halfsy, she couldn’t run for 30 seconds straight. Now, running 3 miles is simple, she said. The night before the race, Melinda hosted a pre-race pasta feed at her house and had most of her family in town to cheer her on as she endeavored to run the longest race of her life. And the Halfsy didn’t disappoint, Melinda said. There was lots of energy, tons of spectators and she loved knowing her family was following along. But three miles into the race she got sick, the kind of sick that made her lose her breakfast on the side of the route and forced her to walk the majority of the race instead of run. Melinda said she’d never been sick like that during any of her training runs, and it was disappointing to not be able to run as much as she’d hoped, but she’s also extremely proud of herself. Running the Halfsy wasn’t about getting a specific time or even showing off her skills to her family, for Melinda, it was about finishing what she’d started. It was about more than running, but rather, taking back her health and doing something for herself. Melinda never thought she could run 3 miles, and 13.1 seemed crazy back when she started training in the spring, but she did it and she’s not done either. Being a part of the 6,000 other runners at the Halfsy made Melinda stop and think about her journey to race day. At times she didn’t think she could do it, and she said she knows she wasn’t the only runner to feel that way during training. 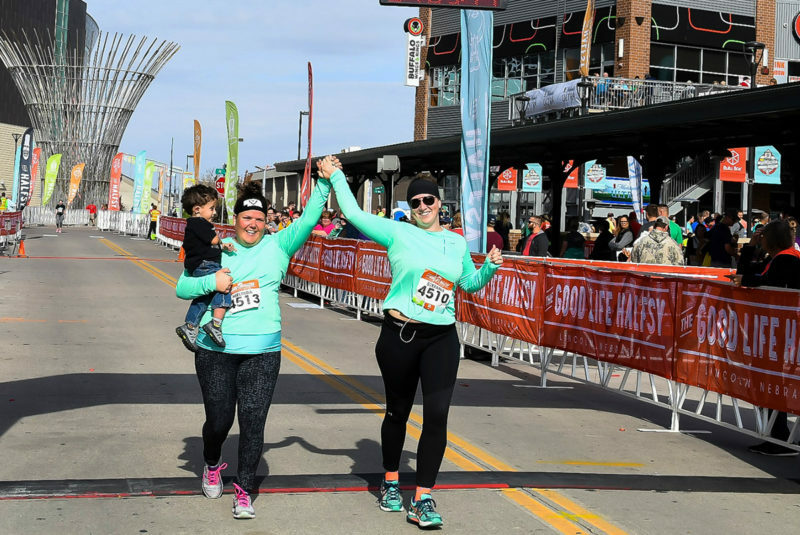 She and her friend ran the Halfsy together, and having the support of a friend, the thousands of other runners and the community was a huge part of the race, she said. People took time out of their day to make signs, hand out water and encourage runners, and for Melinda that kind of support made her want to run another race. She was honest in saying she’s not so sure about running another half marathon quite yet, but she can see some 5ks and even a 10k in her future. Her running journey started as a way to make healthy choices and think about her own body, even as a busy mom with young kids. Before she crossed the finish line, Melinda ran over to her husband and got her 2-year-old son, Zayln. She carried him across the finish line with her and then was surrounded by her family to celebrate. She’s proud of the race she ran, but she’s even more proud of the months that lead up to the race and the way it’s given her a healthier life. Check back for more Halfsy Hero stories, or go back and read the four installments of Melinda’s story.